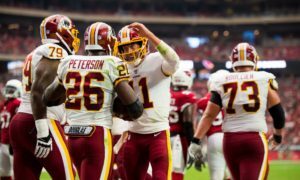 The Washington Redskins have the second highest team total this week, at 27.25 points, and are favored by a solid 7.5 points. That puts their offense strongly in play for fantasy purposes, and we can expect multiple players to put up enough points to help your teams. Cleveland has only allowed two rushing touchdowns to opposing running backs, and held every opposing running back under 80 rushing yards. Meanwhile, the Redskins haven’t given any of their own running backs 20 or more touches in any game this season. 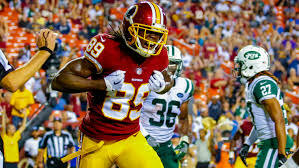 Matt Jones’ 65 rushing yards in Week 3 is the highest total of any Washington running back in any game this year. For those reasons, it will be smart to stay away from the rushing attack this week, and rely on the Redskins’ passing attack when making fantasy lineups. Now let’s take a look at which Redskins players are in play for your daily fantasy football lineups in Week 4. Cleveland has given up at least 278 passing yards and two passing touchdowns in each game this season. Each quarterback they have faced has set their season-high mark for passing touchdowns in their game against the Browns. Kirk Cousins is averaging 329.67 passing yards per game, and just racked up 19.34 fantasy points last week against the New York Giants’ defense that held Drew Brees to only 14.52 fantasy points the previous week. 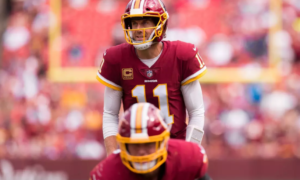 Cousins is averaging the fifth most passing attempts per game in the NFL this season, and as I mentioned earlier, the matchup this week bodes well for the Redskins passing attack. He’s a bargain on both daily fantasy sites and is one of the top plays at his position. Roll Cousins out with confidence in any contest this week. Through the first three games this season DeSean Jackson has 10.20, 4.00, and 15.60 standard fantasy points. He has also caught at least one pass of 28 yards or longer in each game, and his double digit performance in Week 1 came without even needing a touchdown. Cleveland has already allowed double digit fantasy points to five wide receivers this season. They have also already given up six touchdowns to opposing wide receivers this year. Jackson is in play in all formats, and will get a boost if Joe Haden is unable to play for the Browns. 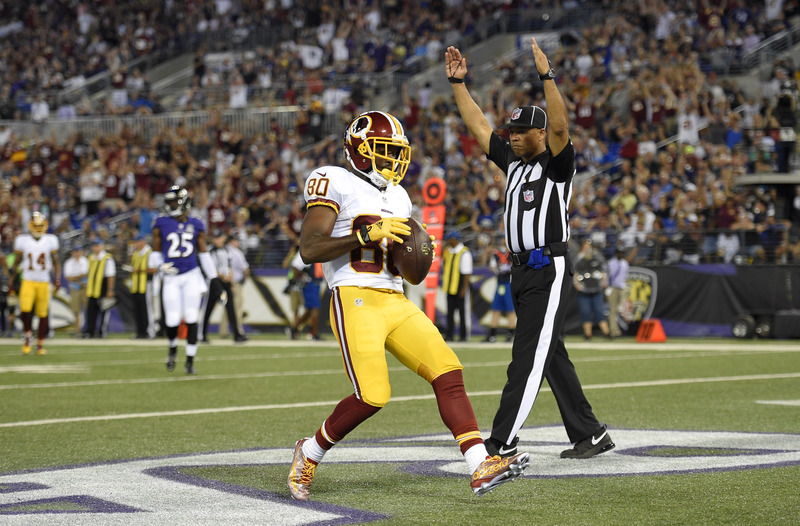 Jamison Crowder’s 24 targets this season are tied with Jackson and Jordan Reed for the team lead. He has scored in each of the past two games, and now gets his best match up of the season. Cleveland has allowed opposing slot receivers to go over 60 receiving yards in each season. In Weeks 1 and 3, they gave up seven receptions for over 100 yards and a touchdown to the opposing slot receiver. On DraftKings, Crowder costs only 8% of the total salary cap, and makes for one of the best value plays of the week in any format in the PPR format. He costs 2% more of the salary cap on FanDuel, making him less of a must-play, but he is still a good value option there. Only four tight ends in the NFL this season have seen a higher percentage of their team’s targets than Reed. He hasn’t come close to his fantasy production from last season, but the high number of targets gives him a solid floor, as well as a good chance to get back to that 2015 form. Cleveland has already allowed one opposing tight end to surpass the 100 yard receiving mark, and this matchup bodes well for Reed to continue being targeted at a high rate. The problem with Reed in daily fantasy this week is that he’s the second highest priced tight end (trailing only Rob Gronkowski) on both sites. The targets are there, and the matchup is good, but there are cheaper tight ends that could give you similar production for much less money. Dustin Hopkins is off to an incredible start to this season. His 38 fantasy points are the most among all kickers through their first three games, and he’s had at least 11 fantasy points in each game. The Browns are allowing the 10th most fantasy points to opposing kickers, which gives him another plus matchup. In one of the biggest salary mishaps of the week, he somehow only costs the minimum price on FanDuel. It’s hard to find a roster decision easier than this, and Hopkins is a very strong play in all contests this week. Cleveland is coming into this game having given up an average of 10 fantasy points per game to opposing defenses. They are down to their third string quarterback for the second week in a row, and have given up the fourth most sacks in the league. Since giving up 38 points in Week 1, Washington’s defense has racked up six sacks and four turnovers in the past two games. They haven’t reached double digit fantasy points in any game yet this season, which hints at a lower ceiling than some of the other teams. For that reason, it would be smart to mix in other teams throughout your tournament lineups. They do have a solid floor, which puts them strongly in play in cash games – especially on FanDuel, where they are the 10th highest priced defense, compared to the fourth most expensive on DraftKings.